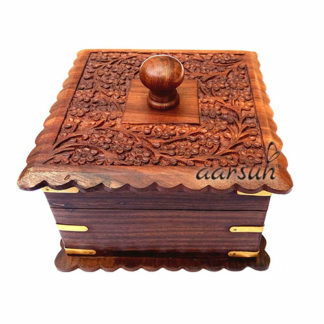 Aarsun Handmade wooden dry fruit box in fine quality wood with beautiful carving and finishing by skilled artisans. The wooden dry fruit Box is square shape designs with brass work and wooden knob at the top. The box is separated in four section from inside and there is brass work also done over there at the side of the Box. You can also use it as a gift to your near ones and serve to your guest as well.